Frugal & Fabulous: Stockpile Ideas: Salad Dressing? While going through my stockpile the other night I noticed I have somewhere between 10-15 bottles of salad dressing (mainly Italian & Ranch.) My question to you, dear readers... what do you do with extra dressing? I have used Italian dressing as a marinade for chicken. I use ranch/blue cheese dressing in buffalo chicken dip. Probably obvious, but we use ranch dressing as a dip for raw veggies. I also add it to mashed potatos. Ranch - We dip our pizza crust (or the slice itself) in it. We mix it into ground beef and make meatballs out of it. Mix with buttered noodles or serve with mashed potatoes and you've got a yummy meal! I use oil-based dressings in place of olive or vegetable oil when I'm sauteeing meat (sausage, chicken, pork) or vegetables...it adds lots of flavor! I love the idea of using cream dressings in mashed potatos! It would probably work with mac & cheese too, for extra flavor! Italian to marinade or use in pasta salads. 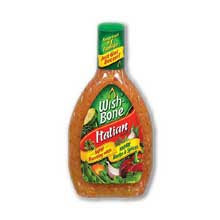 Try mixing Italian dressing and soy sauce (2 parts italian to 1 part soy). Marinade chicken breasts for 4-6 hours and grill! Yummy! For the ranch, try 1 box bow tie pasta, 1 pound cooked crumbled bacon, 2 large ripe tomatoes diced, 4 scallions sliced, 1 cup mayonnaise, and 1 cup ranch for an awesome pasta salad 'bow tie salad'...everyone asks me for this recipe when I bring it! I had the same problem, lol. Do you have a slow cooker? I use the Italian on potatoes and veggies as a marinade in it. The Ranch, DH usually uses it on sandwiches instead of mayo, and to dip his fries in. I use Italian Dressing or Honey Mustard instead of margarine or oil to brush on bread for paninis and grilled cheese - adds some extra zing! Cover chicken in ranch and allow to marinate. Crush Ritz crackers into a shallow bowl add 1 teaspoon season salt, 1/2 tsp pepper and 1/2tsp garlic powder (or use whatever seasonings you like) and mix. Remove chicken from marinade and coat with Ritz mixture. Line a cookie sheet with foil paper then place a wire rack on top. Place chicken on wire rack and bake on lowest rack in 400 degree over for 30-35 min.